Interviews with Left Coast musicians + guest composers! Get to know cellist Tanya Tomkins! How did you first meet composer Clarice Assad? My sister Leslie has a chamber music festival in Moab, Utah and I met and heard Clarice perform there in 2015. I was blown away. The next year I heard her guitar concerto premiered in San Francisco by Marc Teicholz. I was so struck by the amazing sounds she got out of the orchestra and how it blended with the guitar. She created this unifying tapestry of sound that really challenged the idea of a concerto. How did the commissioning of Lemuria come about, and what made you want to do a piece about climate change? For years I have felt my role as a musician was limited in the bigger scheme of what we are all facing right now: the catastrophic reality of climate change. Just recently the esteemed historian (and cellist in this piece!) Tom Laqueur reminded me that music is one of the great things we have on this earth that is worth saving, and that being a cellist might be as beneficial as protesting. So I decided to keep playing and commission a piece about it. I immediately thought of Clarice’s fantastic guitar concerto and asked her to write something on this theme. Clarice came up with the perfect narrative for this composition. It is a positive example for us, rather than an expression of sorrow, which it just as easily could have been. It is so beautiful, and so typical of Clarice, to musically point us toward joy as opposed to the more obvious tragedy. Anna Presler and I were walking in the Berkeley Hills talking about this commission and how nothing makes people happier than cellos. So we decided that this piece should be for many cellos, and cellists of all ages and abilities. This magically fit in with Clarice’s experience in writing for all levels of musicians (the daughter of the famous guitarist, Sergio Assad, she has written many pieces for guitar orchestras- from amateur to professional). The world needs to come together now to try and solve our current environmental crisis. I really like how Lemuria brings us all musically together. It is a very unifying piece. What are the joys and challenges of preparing this new work? Like the guitar concerto I heard, Lemuria goes even farther with the idea of “inclusivity.” It has been such fun working in a group that includes a talented 14-year-old cellist, a Pixar employee who plays the cello, a highly accomplished professor that plays the cello for a hobby, and many other cellists from all walks of life. It completely challenges the idea of the concerto. In fact, it is the opposite of the usual idea of the concerto as pitting the better players against the rank and file players in the orchestra. It joins us all together in a thrilling swirl of sound and rhythm. There is literally something for everyone in this piece. It fits in with the Left Coast ethos of friends getting together to play. When did you first fall in love with playing Bach? I have played Bach since the first year I played the cello at 8 years old. Almost 50 years later Bach remains a teacher, a friend and an inspiration. I will never catch up to his total mastery of music, but I love being in the company of it. There is nothing sentimental about it, and it is very powerful. It is also crazy to “perform” solo Bach from a stage. It is such intimate music and should really be played for a friend or two in a small space. Or better yet, just alone in a dark room where you are free to explore it endlessly without having to commit to any particular interpretation. One should never compete with Bach. He always wins. The player is just there to remind us of this fact. What is your proudest musical accomplishment? Being a musician can be pretty one-sided sometimes. I am very proud that Eric and I learned so many new skills over the last five years and were able to found a festival from scratch. It is the most challenging thing I have ever undertaken, but I am also very proud of what we have been able to do. Who are some teachers or mentors whose guidance stayed with you over the years? My teacher in Holland, Anna Bijlsma used to tell me to forget everything he said. He said a true artist figures everything out themselves and doesn’t just follow the advice of the teacher. He used to say that that was his dilemma with teaching. For many years after my five years as his student I couldn’t stop thinking about all the incredible things he taught me, and so I knew I was “failing”. Now I just remember that he was an enormous influence on me. Maybe I have almost forgotten now, and that is a good thing, according to him! I am just starting the Overstory by Richard Powers. I am also in the middle of a book about the great Parisian “salonniere” Winnaretta Singer, the Princess of Polignac. Her salon had Proust, Stravinsky, Faure and many other amazing artists in it. She has an incredible story and did a lot for music. Click here for tickets and complete program information. Get to know composer Clarice Assad! How did the commissioning of Lemuria come about, and what was inspiring to you about the theme? In 2018 Tanya Tomkins approached me with the idea of working on an interesting program about nature, and at that time I had been reading about ancient (real and imaginary) lost civilizations, so I made the connection between rising seas and destruction by water (that happens in so many mythological stories) and what is happening in our world today. Tell us about how the various “voices” help tell the story. I was having creative fun with the idea of inventing a new language, so using the voice as a percussive instrument to create sounds, seemed very fitting. I am so curious to see how it will sound outside of my own head. In addition to composing you’re also an accomplished performer, particularly with vocal jazz. How does your work as a vocalist influence your composition style and writing process? I began singing before I started playing piano, so in a way, composing and singing go together in my mind. I hear a lot of ideas in the sound of my own voice, usually in layers, instead a piano sound or orchestral sound. I see a huge difference between creating and arranging because it is only when I sit down to write my ideas that I begin to think about how they should be crafted for a particular instrument. You work in a variety of different musical styles as a performer and composer; tell us about your different influences and interests. I love projects that are unusual, and I appreciate the opportunity to do things I have not done before, since I tend to learn. I love reading, and work really hard to retain information in my brain, which means, I am fascinated with the world of making connections both intellectually and in social contexts. I am also fascinated with people and their stories. So all of this creates an intense desire to share what I learn, and to create something of value for the majority of people involved. I strive to include interesting parts for every musician and I am always thinking about how can what I am doing be of importance to the ones experiencing it. A few years ago I worked on a project with the Boston Landmarks Orchestra on a live concert with too many moving parts involving a conductor, an orchestra; two choirs of amateur children, one of them led by me - The language that was not native to the children; who were also require to go along with improvisations — Also there was a Brazilian percussion group playing in between sections of the piece, all intrinsically connected. The pressure of playing for 3 thousand people made my stomach turn; we had all the perfect ingredients for failure. But miraculously we came through! Bruce Berr, my dear dear piano teacher during my undergrad years in Chicago who just passed a way under a year ago was very inspiring to me… I miss him very much. I am reading about Archetypes, which are ancient, universal patterns of human behavior that manifest through characters, actions or situations in stories, fables, fairy tales and myths. It is a great recipe for storytelling so I am exploring that now, in music. It still remains to this day, the Color Purple, that I saw when I was 10 year old and never forgot. What do you love to do on your days off? Get to know oboe player Andrea Plesnarski! All reed players (oboe, bassoon, clarinet, saxophone etc) make reeds from Arundo donax, a specific bamboo species, that works well to make a resilient vibrant reed that is the noise maker on reed instruments. Flutes reflect air against a sound tube. Brass players buzz to create their sound. Double reeds are two blades of bamboo wrapped together to create a vibrating chamber. The blades vibrating together are a lot like our two vocal chords that vibrate when we sing and hence a lot of people think the oboe and other double reed instruments have a sound that closely resembles the human voice. Oboe bamboo cane costs about $200 a pound and has a lot of machinery and hand tools that shape it and refine it into a workable reed. Oboists spend 80 percent of their time making reeds and 20 percent practicing. A typical oboe reed usually lasts about 10 hours of playing if we are lucky and are extremely sensitive to temperature and climate conditions like humidity. It is one of the hardest, but also sometimes the most rewarding part of being an oboists. We are musicians and craftsmen. I learned a lot from my oboe teachers, but I also learned a lot from musicians who were not oboists. I think some of my greatest musical inspirations have been violinists, Henryk Szeryng and Gidon Kremer, and singers, Dietrich Fischer Diskau and Elly Ameling. Andrea gives us a tour of “The Reed Room” she shares with husband and fellow LCCE oboist Thomas Nugent. I have always felt a deep connection to Bach and he always graced oboe players with some of the most sublime moments in his liturgical music where we get to comment and swirl around a beautiful sung text. Beethoven also is some of the most fun to get to play in orchestra. I love Lutoslawski's music and got to meet him when I was in school and only wish his music was more part of contemporary repertoire. I generally enjoy going on a long run, an all day hike, working in the garden, or volunteering. Favorite Bay Area hiking trails? Matt Davis to Stinson and back up the Dipsea and Steep Ravine trail is our all time favorite trail to do. I understand you also do landscaping? I got certificates in Horticulture and Landscape Design form Merritt College and so far have only practiced on my own garden. I'm hoping to branch out and do it for others. I'm taking a great shrub id class this semester and it's so great to learn a lot of long botanical names and ruminate on how plants look, feel, and smell. Tell us about your amazing garden and urban farm in Oakland. We really love having a peaceful garden. We have 4 big raised beds and pack them with about 30 tomato plants, lots of lettuce, kale, chard, onions, herbs and anything else we can fit in. We've had two different flocks of chickens over the past several years and they are funny creatures with their own distinct personalities and temperaments -- and the eggs are truly amazing!! In addition to your music degree from Curtis you also have an MA in Computer Science from Mills College. Your MA thesis sounds fascinating, particularly “the creation of a human interface to allow the user to compose and play music using a piezo sensor gestural interface utilizing software with neural networks and Markov models.” Tell us more! My thesis was an interface to allow non-musicians be able to have a responsive instrument that could give them the opportunity to have the joy and experience of creating music without the steep learning curve we have all tackled. I would love to have dinner with Emma Goldman, the anarchist political writer and activist from the early 20th century. If I could pick two people, I would make it a trio with Emma Gonzales from Stoneman Douglas High School in Parkland, FL. Click here for ticket and complete program information. Get to know soprano Nikki Einfeld! What are the joys and challenges of preparing a program that spans several eras, from early Bel Canto Bellini to the contemporary Sheila Silver? The different musical genres often require different types of vocal shading to properly depict the era, poetry, or style of writing. In particular there are some lower passages in some of the works that need more of a chest resonance than the Bellini and Bachelet need, for example. Different languages also sing differently. I love the challenge of serving all of the composers and their styles. With a well-balanced program, which takes in to account the needs such as range and depth of emotion, this promises to be an amazing program of vocal treats. What do you love about revisiting the famous aria “O quante volte”? While I have sung Bellini’s “O quante volte” from I Capuleti e i Montecchi before, it’s never been as a part of the actual opera. That is still on my bucket list! Recently I have spent a lot of time singing premieres and works written in the last century, though my roots in singing come from the Bel Canto greats. This style of music informs a lot of my technical singing and as a coloratura I sing florid music very comfortably. The long connected legato phrases interspersed with the more rapid coloratura passages require great breath control and overall support. This vocal technique applies easily to many styles of music but the term “bel canto” or “beautiful singing” is widely recognized in the Italian repertoire. What are you enjoying about preparing Britten’s Songs From the Chinese? Michael Goldberg and I have not worked together in a very long time. It was my first concert with Left Coast, where I stepped in on fairly short notice to sing Sean Varah’s Four Neruda Songs and Kolb’s Songs before an adieu with flutist Stacey Pelinka back in 2004. This was my introduction to a long and wonderful relationship with Left Coast Chamber Ensemble and all of its wonderful members. It will be nice to come full circle and share the stage with Michael again. I am actually reading Le Roi S’amuse by Victor Hugo in preparation for my role debut as Gilda in Rigoletto in the new year. What are those??? Ok, seriously I have two beautiful young girls who are quite the little performers themselves! When I am not running them to and from their rehearsals (!!) we enjoy hiking around Marin County where we live. I feel truly spoiled to live in such a beautiful place! Ok, truth time. I really want to meet Barbra Streisand. I got to see her perform a few years ago, and she has been an inspiration to me since I was a wee little thing. I don’t mean to be super picky, but I don’t mean just shake her hand, I really want to pick her brain. I also really wanted to meet Beverly Sills. I got really close once after the Met Finals I sang in several years ago. I was tickled pink to sing “The Willow Song” from Ballad of Baby Doe but I missed her at the after party…. What about a favorite opera? There is so much amazing opera out there, but I guess I do generally have a small bias for operas that include my voice type. One of my favorite opera performances to date has been of Donzetti’s La Fille Du Regiment. While it is known as a “comedy” it is really a very honest portrayal of a young girl’s experience with self-discovery. Love, loss, family, and how we deal with change - and all the while we can still find the room to laugh, because after all life is sometimes pretty funny. Favorite meal to enjoy after a long performance? This is not a meal, but after a late night performance I am more of a snacker (to avoid gastric problems that can sometimes affect the voice). I do have a bit of an addiction to Sweet Plantain Chips from Trader Joe’s and you can often find me polishing off a bag of those! Potassium is good for you though, right? Especially when it is deep fried and covered in salt! MMMmmmm. Get to know guitar player Michael Goldberg! What are the joys and challenges of playing Schoenberg? Although the harmonic language is complex, Schoenberg's Serenade is easy to relate to emotionally. The music is very expressive and lighthearted, full of wit and joy, with the exception of the 4th movement when the baritone sings a lament about his lost love. Serenade is beautifully orchestrated, full of intricate and complex ensemble work. And, above all, it is really fun to play! While preparing pieces from Jemnitz and Schoenberg, student and teacher, have any parallels come to light between their music? Both pieces are full of emotion and convey a sly humor and wit. They both are written in classical form, the musical gestures are easily understood even though the harmonies aren't traditional. Jemnitz's Trio also has a strong influence of Hungarian Romani music. As far as I know, these are the only pieces either composer wrote with guitar. What are some of your proudest musical accomplishments? It is hard to point to any single piece but one thing that comes to mind is a recent piece that I performed: Canticle by Dusan Bogdanovic. The rhythmic ensemble was tremendously complicated; guitarist Marc Teicholz and I spent an incredible amount of time working painstakingly on the ensemble. I learned a lot about practicing very slowly, learning to really hear every note and harmony, no matter how fast. And it really challenged me rhythmically. I recently finished Educated by Tara Westover. It is her memoir about how she was raised by survivalist ultra-religious parents in the remote mountains of Idaho, brought up to believe the end of the world was coming soon, almost completely cut off from mainstream society, never going to school or even seeing a doctor, surviving a lot of violence in her family. Eventually she seeks out a different life, and tries to get admitted to a local college. Although she had been so isolated and poorly educated that she had never even heard of the civil rights movement or the holocaust, she eventually embarks on a journey which culminate in her going on to receive her Ph.D. from Cambridge University, and having had to essentially reconstruct her entire sense of reality. I haven't been to any films recently although I have been enjoying re-watching Doc Marten on TV. Get to know flute player Stacey Pelinka! Do you remember the first piece you played on the Orpheus theme? Definitely! It was the Gluck Minuet and Dance of the Blessed Spirits, which we've programmed on this concert. It's a staple of the flute canon, something that I learned early on as a student, and am happy to revisit now with more nuance and understanding. The minuet's melody is simple, woven with the sweetest counterpoint from the strings; the dance is longing and full of pathos. It's a beautiful piece. What are the joys and challenges of playing a single program featuring Monteverdi through a world premiere? The joys are experiencing both Monteverdi's world, in which concepts of tonality and meter were just beginning to take conventional form, and Aida Shirazi's world, where those conventions have long been subverted, but still inform her style in subtle ways. It's great to delve into two such different musical worlds and sense them reaching toward each other through time and space. Each piece teaches me something new, and I learn so much from working with my colleagues in Left Coast. Tanya, with her expertise in music of the past, has been helping us with phrasing, color, and articulation in the Monteverdi, and we will work with Aida Shirazi as we learn her piece, and learn about her sound world firsthand. The challenges? Not so many. I find that when I play old and new music together, each strengthens the other: I can look for gesture and expressiveness in the new music, and find a greater range of expression for the older music. What have you been enjoying about preparing the Shirazi world premiere? I'm intrigued by the flute part for the Shirazi which shows the expressive influence of Iranian classical music, yet remains fresh and original. She uses extended techniques on the flute, notably percussive and breath sounds, to great effect. Most of them have been with Left Coast: playing the Debussy Sonate for flute, viola and harp twice with Kurt Rohde and Karen Gottlieb; revisiting Elliott Carter's Enchanted Preludes for flute and cello with Leighton Fong as we performed them together for the third time, and realizing how much deeper I had sunk into the work each time; and working with composer Amadeus Regucera over a decade, and becoming a kind of specialist in his style of writing for the flute. Left Coast commissioned his work Crave in 2014. Also, once in a rehearsal for Mahler 3, I distracted the conductor by playing a piccolo solo with enough pathos that he forgot to keep conducting. I trained in the Feldenkrais Method of movement awareness with Dennis Leri, who was the best teacher I have had of any subject. His enthusiasm for his subject was infectious, his teaching was devoid of any ego gratification, and he worked constantly to inspire curiosity and inquiry. Any memorable advice you received over the years from teachers or mentors? Favorite recording? Again, very difficult, but I love the work Philippe Jaroussky has done with Christina Pluhar's Arpeggiata. I also enjoy Eric and Tanya's recording of Beethoven Sonatas. Favorite composer? Britten, Berio, Bach, Monteverdi, Messiaen, Debussy, Mozart, friends Amadeus Regucera and John MacCallum--ethereal, expressive, human music. The Dalai Lama--such a wise being, but able to express himself in the simplest terms. Lila by Marilynne Robinson, a very sweet and tender novel. What do you love doing on your days off? Curling up and reading with my daughter Annabelle and/or my partner Joe; hiking and gardening, spending time outdoors. Aida Shirazi. Photo: Kioumars Kalami. Get to know composer Aida Shirazi! In writing your piece Vestiges, what drew you to the Orpheus myth? At first glance, love and selflessness seem to attract one to the myth of Orpheus, however, what I am actually interested in, is the imperfection of Orpheus's character, which leads to his hamartia. On the one hand, he takes his power from music, and is convinced that with music he can bring Eurydice back from the world of the dead; on the other hand, his doubt is what takes her away from him once again and forever. The coexsistence of conviction and doubt, divinity and human, and power and weakness is what attracts me to this myth. I also think a lot about the radical view of some philosophers like Plato, who saw Orpheus as a selfish lover and his love as untrue, since he tricked the Underworld to bring Eurydice back to life, rather than choosing to die to unite with her. Often, I wonder how selfless, free and true human love is, and that is another reason why the myth of Orpheus strikes me; I like thinking about this question and see this the story from different and even opposing angles! In Vestiges, do any instruments play specific roles in the Orpheus story? The flute is the hero; it tells the story. The strings sometimes make a commentary on the flute, and other times echo it. In July 2017, my trio for flute, viola and harp was performed in a concert curated by MATA Festival in New York City, and reviewed by The New Yorker. I have spent two prosperous and exciting years as a PhD student of composition at the University of California, Davis, and this will be one of my all-time proudest musical accomplishments. I owe my current and future achievements to the support of the unique faculty and staff of UC Davis. I am also a co-founder of the recently established "Iranian Female Composers Association," which focuses on supporting the Iranian woman composers, who are spread around the world, and happen to have extremely diverse backgrounds, compositional languages and stylistic preferences, which may come as a surprise... As IFCA we are trying to address the common obstacles that female composers face on a regular basis, regardless of their nationality and residence. In addition, our mission is to promote and support each other by give the world a realistic view of ourselves as a group, whose quality of work is often overshadowed by exoticism and other trivial approaches. How are your compositions shaped by the rich musical influences of your upbringing in Iran? I grew up in a family of amateur musicians and artists. I see myself as someone who has benefited equally from the Western and Iranian classical traditions. My mother and brother used to play piano, and as we had one at home, soon it became my toy. While my mother and brother played classical music, my grandfather, who was a self-taught "taar" (Iranian plucked string instrument) player would improvise on Iranian classical and folk tunes on the piano. This is still one of the most salient musical experiences I have ever had... My father was an amateur "tonbak" (Iranian percussion instrument) player. We had records and cassettes of both Western and Iranian classical music in our house. I started taking piano lessons at the age of eight, and before turning eleven, I picked "santoor" (Iranian dulcimer) as my second instrument. I learned the theory of both musics at the same time. My works are equally informed by both traditions. I identify myself as a contemporary classical composer, who has used some of the harmonic, structural, melodic and rhythmic elements of classical and folk Iranian in some of her works. Also, my father's fascination with literature drew me to this world from an early age, and ever since, I have been influenced by Western and Iranian literature as an individual and a composer. Do you have a favorite musical work? Too many to name, but I always enjoy listening to the music of Kaija Saariaho, Giacinto Scelsi, Claude Vivier, the vocal repertoire of Renaissance and early Baroque periods, as well as the music of two legends of Iranian classical music, Kayhan Kalhor and Hossein Alizadeh. Again, it is impossible to limit my answer to one person; there are many, but I think in the world of contemporary classical music, Saariaho wins the contest statistically, as I love a lot of the works of her oeuvre. Favorite musician of all time? "The Dreamers" by Bernardo Bertolucci, "The Fountain" by Darren Aronofski, "The Color of Pomegrantes" by Sergei Parajanof, "Taste of Cherry" by Abbas Kiarostami, "Hamoun" by Dariush Mehrjui, among many many others. I just finished Murakami's "Absolutely on Music," which is a series of interviews with Seiji Osawa, and started Virginia Woolf's "Orlando." Alongside watching films and reading, I do indoor climbing. It is my newly found passion. I like it, because it is good for body, mind and ego! 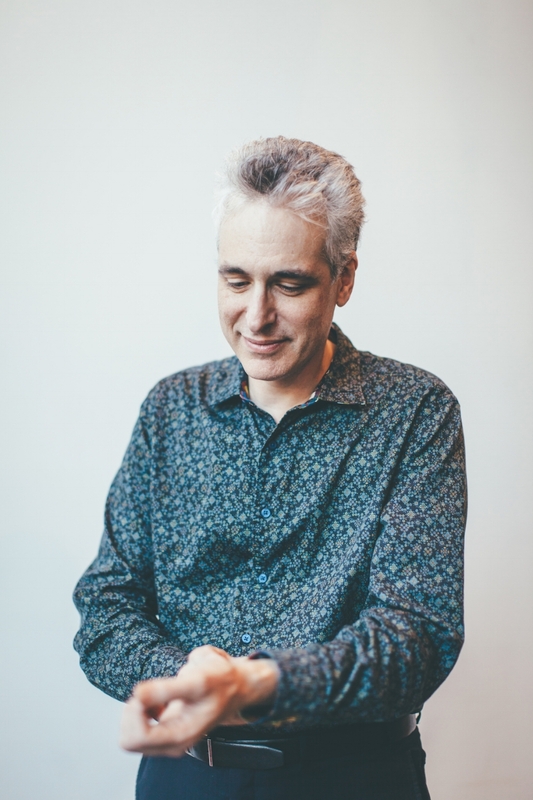 Get to know pianist and composer Eric Zivian! What draws you to Messiaen? To Visions de l’Amen? I am drawn to Messiaen chiefly in that he is one of the most individual composers in all of music history. I also admire how he is never afraid of extremes - of consonance and dissonance, loud and soft, complexity and simplicity. Visions, like all Messiaen, is challenging in that its musical language does not “fit” in the hands, at least as they have been trained by earlier music. The joy of playing it is simply discovering its amazing sound worlds and broad scope. Although these days I don’t have much time for composition, I am very proud of The Swan Takes Flight, the piece that I wrote for Jerry Simas and that he plays so beautifully - thanks for asking for it, Jerry! In terms of my playing, I’m very happy with my recording of the complete Chopin Preludes. Some of the teachers and mentors I will always remember are 1) Peter Serkin, who taught me how to bring out the contrapuntal subtleties in a piece of music, 2) Edward Aldwell, who helped me with theory and analysis and was the first to bring to my attention questions of style in 18th-century music, and 3) perhaps most importantly, Marina Geringas, my teacher in my formative childhood years, who taught me how to work! I do have a "special relationship" with Robert Schumann. I wouldn’t think of him as the greatest composer ever - I’d nominate the usual suspects like Bach and Beethoven for that - but I feel like I understand and identify with him. No intention or desire to throw myself off a bridge into a river though! Tanya and I are right now reading The Adults in the Room, by Yanis Varoufakis. It’s an account of the Greek debt crisis. Dense, but fascinating. What is one of your happiest moments? Happiest? I think some of the happiest moments of my life are after I take a long, hard bike ride (50-100 miles). I don’t get to do that very often, but when I do I feel a tremendous sense of contentment and lose all social anxiety. How do you relax on your days off? What I love doing on my days off - more like hours off in recent years - is road biking and playing bridge (the card game). Also, just being with Tanya and friends and talking about life. Thanks Eric! Any final words? Playing the piano - whether practicing, rehearsing, or performing - is an intense, physically and mentally pleasurable activity for me. I am so happy I get to do it with fine musicians like those in Left Coast!